Flat foot is a foot condition in which the arch of the foot has either partially or totally dropped or has never developed. While it is common in babies and small children, it can become a problem in adulthood if the arch never forms. For adults, the development of flat feet can be brought upon by injury, or due to increased elasticity (such as occurs during pregnancy), or obesity. Those who have health concerns such as rheumatoid arthritis or diabetes may also be at greater risk for developing the condition. 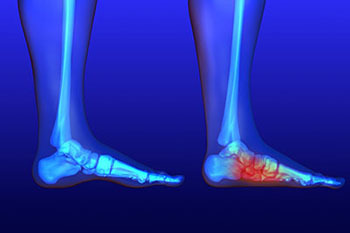 Once flat foot has been diagnosed, your podiatrist may suggest one of several treatment options. Flat feet can be rigid, in which the feet appear to have no arch even when the person is not standing; or flexible, in which the person appears to have an arch while not standing, but once standing the arch disappears. Those with flexible flat feet may benefit from functional orthotics which are designed to realign the arch and foot. In cases of rigid flatfoot (no arch whether sitting or standing) accommodative orthotics or shoe inserts may be effective in relieving symptoms. At Liberty Bay Foot and Ankle, our podiatrist devotes a substantial portion of his practice to evaluating and treating conditions that are effectively treated with prescription orthotics such as flatfoot, heel/arch pain and several other conditions affecting the foot and ankle. In some cases arch supports may be effective in relieving symptoms and in other cases prescription orthotics may be recommended to most effectively realign the foot.